At Meridian, the children can choose between a hot school dinner or a packed lunch from home. The children from EYFS and KS1 eat their lunch together in the hall at 12 o'clock each day. The older children eat at 12.20. The children sit together, regardless of whether they are having a school dinner or packed lunch, they also choose their own seat. All children in Reception (EYFS), and years 1 and 2 are entitled to free school meals under a government initiative. We strongly encourage you to take up this offer. There is a varied menu and a variety of special lunches through the year. In KS2 you may also be entitled to free school meals if you fulfill certain criteria. Please use ton online application form below. We are very proud of our lunches which are provided by Lunchtime UK. All meals are cooked from fresh ingredients each day. Lunchtime UK use local suppliers where possible, and source 55% of all fruit and vegetables within a 50 miles radius from the school. They work to the Soil Association's Food for Life Silver Accreditation, which means that all chicken and pork are 'freedom food', turkey is free range and organic, and beef and lamb are 'red tractor'. 30% of their ingredients are organic, and they have a positive attitude to recycling, food miles and wastage. The company is run by award winning master chefs who continuously train and re-train their staff to high standards. Over the course of the school year, there are various theme lunches - please look out for these and encourage your child to join in! 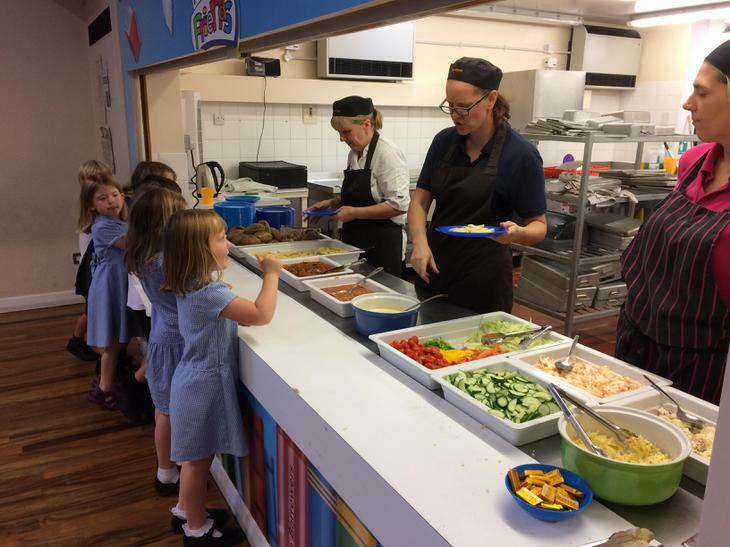 Finally, the food is delicious and is much enjoyed by the children and staff alike! School lunches cost £2.20 per day. Our preferred method of payment is through the Agora schools payment portal https://www.simsagora.co.uk. Please contact Ann Webb in the office to get an activation code or to discuss alternative ways of paying.